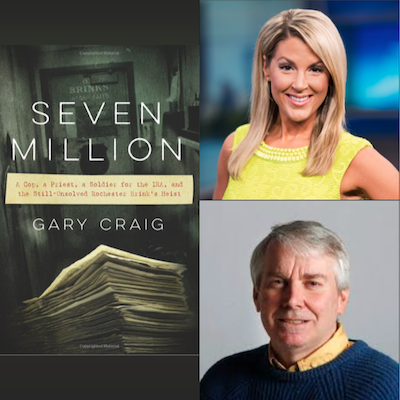 The Gates Library Foundation will be hosting their 3rd annual fundraiser with true crime author and journalist, Gary Craig and guest host, Nikki Rudd on the evening of Saturday, June 15th. Gary will discuss one of the most infamous heists in America, Rochester’s unsolved Brink’s armored car robbery of 1993. Registration is required. Click here to register! General registration is free and includes: Mr. Craig's presentation, silent auction, 50/50 raffle, wine pull, wine tastings, desserts, book sales, and commemorative t-shirt sales. VIP registration tickets are available for $25 and include: all the benefits of general registration tickets plus a sit down with author & journalist Gary Craig & journalist Nikki Rudd, a free commemorative t-shirt, food, and specialty cocktail. VIP tickets are limited to 50 people. Use the link above to register.